European Commission President Jean-Claude Juncker today delivered his 2016 State of the Union address before the European Parliament in Strasbourg. 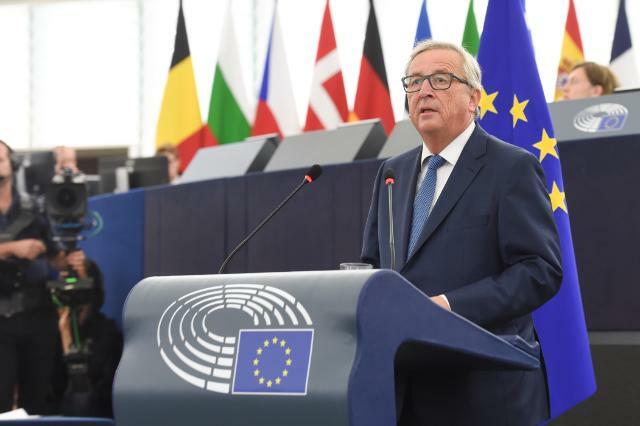 European Commission President Jean-Claude Juncker today delivered his 2016 State of the Union address before the European Parliament in Strasbourg. Setting out his priorities for the year ahead, the President said: "The next twelve months are decisive if we want to reunite our Union. Europe is a cord of many strands – it only works when we are all pulling in the same direction: EU institutions, national governments and national Parliaments alike. And we have to show again that this is possible, in a selected number of areas where common solutions are most urgent. I am therefore proposing a positive agenda of concrete European actions for the next twelve months." President Juncker called for a new sense of urgency and unity as the Union responds to citizens' needs: "We need to deliver a better Europe: a Europe that protects, preserves the European way of life, empowers our citizens and defends at home and abroad." Jobs and growth: "Europe must invest strongly in its youth, in its jobseekers, in its start-ups. Today, we propose to double the duration of the European Fund for Strategic Investments and double its financial capacity." Connectivity: "We propose today to equip every European village and every city with free wireless internet access around the main centres of public life by 2020." Copyright: "I want journalists, publishers and authors to be paid fairly for their work, whether it is made in studios or living rooms, whether it is disseminated offline or online, whether it is published via a copying machine or commercially hyperlinked on the web." Capital Markets Union: "An economy almost entirely dependent on bank credit is bad for financial stability. It is also bad for business, as we saw during the financial crisis. That is why it is now urgent we accelerate our work on the Capital Markets Union. The Commission is putting a concrete roadmap for this on your table today." Migration: "Today we are launching an ambitious Investment Plan for Africa and the Neighbourhood which has the potential to raise €44 billion in investments. It can go up to €88 billion if Member States pitch in." Security: "We will defend our borders with the new European Border and Coast Guard. I want to see at least 200 extra border guards and 50 extra vehicles deployed at the Bulgarian external borders as of October." Defence: "For European defence to be strong, the European defence industry needs to innovate. That is why we will propose before the end of the year a European Defence Fund, to turbo boost research and innovation." President Juncker's State of the Union address and its various initiatives represent the Commission's contribution to the informal meeting of the 27 Heads of State or Government, which takes place on Friday 16 September in Bratislava. The State of the Union speech starts the dialogue with the European Parliament and Council to prepare the Commission Work Programme for the following year. President Juncker and First Vice-President Timmermans today sent a Letter of Intent to European Parliament President, Martin Schulz, and Slovak Prime Minister, Robert Fico, holder of the rotating Presidency of the Council, to outline the initiatives the Commission is planning to take in the months to come. On 15 September 2016, from 11:00 to 12:00, President Juncker will answer questions on the State of the Union from three YouTube creators: Laetitia from France (Le corps La Maison L'esprit), Jonas Ems from Germany (JONAS) and Łukasz Jakóbiak from Poland (20m2) in cooperation with Debating Europe, Euronews and YouTube,. Follow live on EUTube.